People want to shop when they’re ready to shop. The age of technology is allowing consumers to block out what they don’t want to see and use things like push notifications to get what they do want to see. To truly be effective with your marketing strategy these days you have to be less intrusive and more nurturing. Stop shoving your product in peoples faces and start educating them on why using your product over a competitors is the right move. Here are some provocative numbers that show how resources are being pulled from traditional marketing and put behind inbound strategies. Marketers are shifting their budgets away from “interruption” advertising. The average budget spent on company blogs & social media has nearly doubled in two years. Inbound marketing tactics like SEO, blogging, social media, website lead gen and lead nurturing are more cost-effective than traditional forms of outbound marketing. 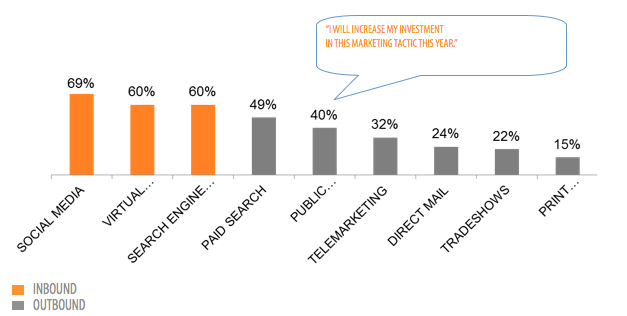 Marketers are shifting their budgets, and seeing results.